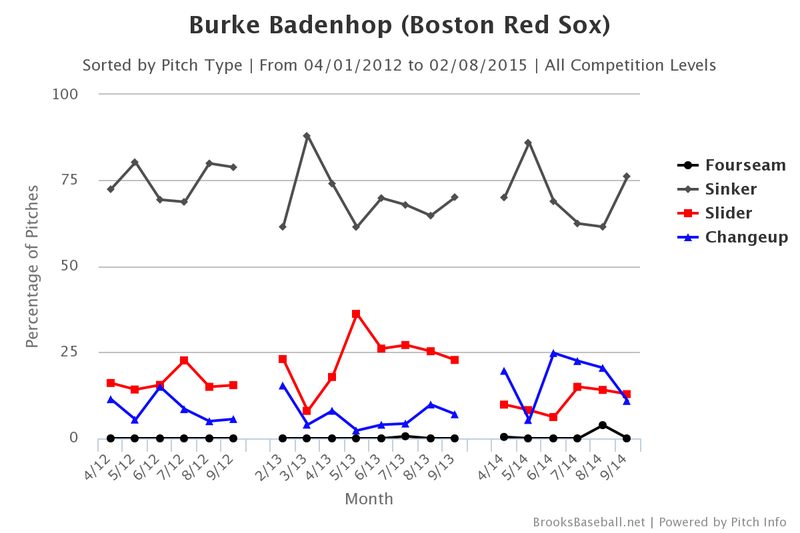 Yesterday, the Reds signed their first "big" free agent of the offseason in right-handed reliever Burke Badenhop. Badenhop, who turned 32 years old today, has been a member of five different organizations since being drafted in the 19th round by the Tigers in 2005. The signed a 1-year deal with the Reds for a total of $2.5 million guaranteed, with a mutual option for 2016 that can bring the total value of the deal to $5 million. That's paying for something shy of 1 WAR spread over two years, even assuming the Reds pick up his option. Seems like a nice deal to me. 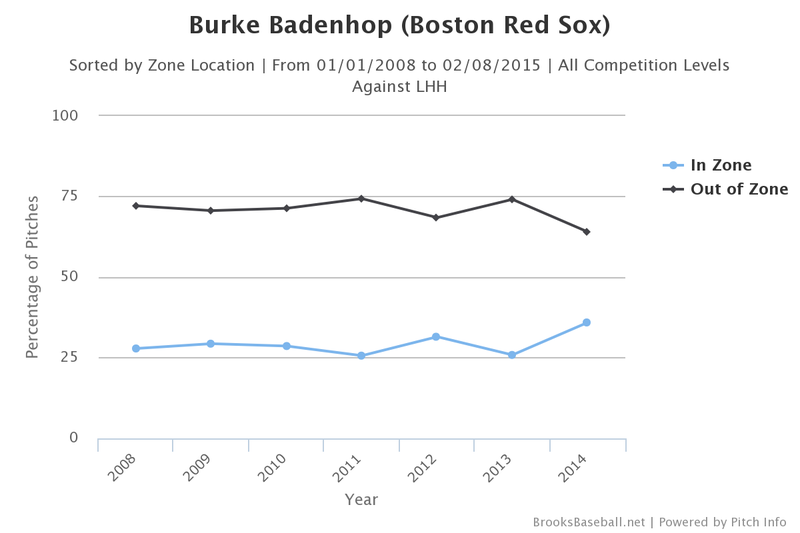 Badenhop seemed to make an adjustment in approach with the Rays in 2012, decreasing both his strikeout and walk rates substantially. This trend has continued in the years since, with an even larger drop in strikeout rate last season with the Reds Sox. In addition to his superb control, however, what has made him successful is his excellent ground ball rates, which climbed all the way to 61% last season with the Red Sox. Low walks and lots of ground balls should work well with the Reds' strong infield defense, so I like the signing a lot. @jinazreds Love him. Smart dude, too. Uses Brooks all the time. Does this awkward walk around between pitches. 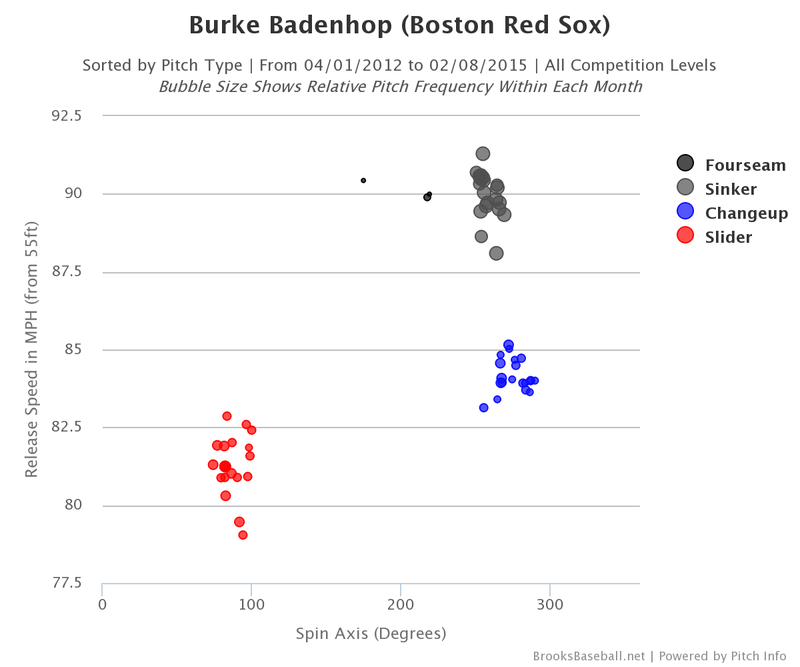 So, we're looking at 75% sinkers, with a small number of sliders and change-ups mixed in. He seemed to experiment with adding more sliders in 2013, and then seemed to almost abandon it in favor of his change-up last year. As you'd expect, he throws more change-ups against lefties, and last year almost threw as many change-ups to lefties as his sinker! While it's great when you can have strikeouts, I think ground ball, low walk rate pitchers should be a good match for the Reds' defense and park. 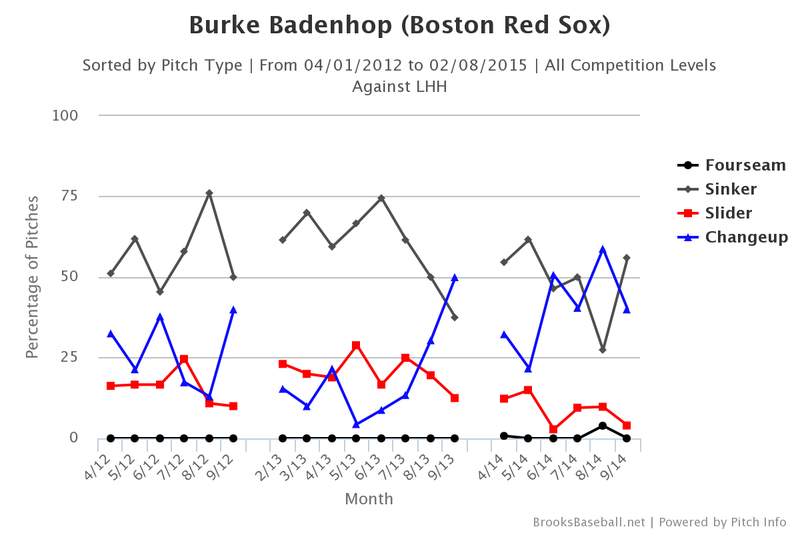 Badenhop looks like a great pitcher to come in against a right-hander with a man on first to induce a double play. He's immediately in the running for second-best Reds' reliever, and should be a nice setup guy for us this season. I'd think he's a good bet to be worth ~1 WAR per season in value, which is a lot less than the Reds are paying him. Even at 32 years old, I like this signing a lot.